The Mighty Sound of Steam, new in '71, was found in this set in the C&O 2-4-2 Steam Engine and Tender. Freight Car included the Wheaties Box Car, TA&G Hopper, BN Gondola with Canisters, Santa Fe Bulkhead with Load and Stakes and a C&O Caboose. A 27" x 54" track plan is provided with Transformer, Foam Buildings and Two Figures. An Illinois Central GP-9 powered this impressive 1971 train set from Lionel pulling an IC Box Car, the GMCX Tank Car, L&N Flat Car with Dozer and Scraper, N&W Covered Hopper, Penn Central Log Dump Car with Logs and Illuminated IC Caboose. The track plan was a big 71" x 36" double oval, two figures and transformer were included. Red and silver warbonnet Santa Fe powered Alco A and dummy B are at the head of this 1971 set. Rolling stock included the TA&G Hopper, Wheaties Box Car, Burlington Northern Gondola with Canisters, Sunoco Tank Car, Northern Pacific Flat Car with Trailers, and Santa Fe Caboose. Track plan included a 27" x 80" figure 8. Lionel's 50-watt Transformer was included, plus two figures. 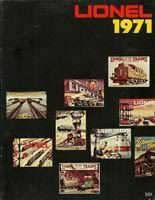 Foam Model Buildings are listed in 1971 Lionel catalog. It is stated that the packing materials were designed to resemble structures and could be decorated for use on a train layout. This 1971 set introduced Lionel's Mighty Sound of Steam feature. Set was powered by a Pennsylvania 2-4-2 Steam Engine and Tender with a Great Northern Hopper, Republic Steel Gondola with Canisters, Union Pacific Flat Car with Stakes and a Penn Central Caboose. The track plan built a 27" x 64" figure 8. Though named Wabash Cannonball, the set had Nickel Plate Road power in the form of a 2-4-2 Steam Engine and Tender and Nickel Plate Road Caboose. Two freight cars in the set and they were the green Republic Steel Gondola and Union Pacific Flat Car with Stakes. Transformer and 27" x 36" track plan finished out the contents. A Detroit Toledo & Ironton Diesel Switcher pulled the Republic Steel Gondola with Canisters, the unique Mini Max Car, Penn Central Log Dump Car with Logs and DT&I Work Caboose. Transformer and 27" x 45" oval track plan was included in the set. Six trains sets are presented in Lionel's 1971 catalog. Four of the six are new for '71 and carry an 1100-series stock number. Returning from 1970, the Wabash Cannonball and Santa Fe Twin Diesel. New for 1971 was The Mighty Sound of Steam. Another interesting concept is Foam Village Packing. Listed in the '71 catalog as a Lionel Exclusive, the foam materials used to protect train set contents were designed to used as buildings. The 1971 shows the foam pieces and next to each are decorated suggestions of user-created finished structures ready for placement on a layout.